Wonderful article in the Sentinel with regards to the sixth form students. ‘The St Thomas More Catholic Academy student completed an internship with Virgin Trains as part of a year-long careers programme. 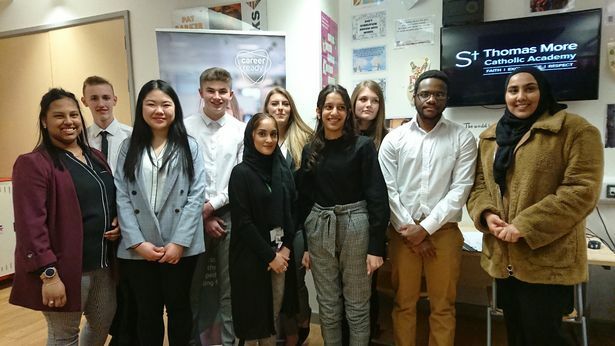 Teenager Roshni Haque has been shortlisted for a national award after Virgin Trains were impressed with her first-class skills on an internship. The 18-year-old completed the four-week placement at Crewe rail station as part of a prestigious programme with education charity Career Ready. She was tasked with assisting disabled train passengers on the platforms and also helped at an information kiosk. Roshni, from Dresden, did so well that she has now gone on to land part-time work at the station. And she’s in the running to be named Career Ready’s ‘logistics student of the year’ next month.